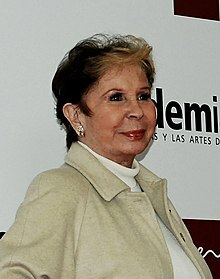 María de los Ángeles López Segovia (20 March 1937 – 20 August 2015), better known as Lina Morgan, was a Spanish actress and showgirl. She performed in movie, theatre, and television. She was known for her roles in Hostal Royal Manzanares (1996), Una de dos (1998) and Academia de baile Gloria (2001). ↑ "LINA MORGAN DEJA SUS BIENES A INSTITUCIONES BENÉFICAS". Europa Press. Retrieved 1 April 2014. ↑ "Daniel Pontes: "Lina Morgan me ha dicho que mande a todos a la mierda"". ABC.es. Retrieved 1 April 2014. This page was last changed on 28 September 2016, at 21:08.